The small village of Batubulan is marked by stone figures of gods and demons on the side of the road. Known mostly for its stone carvings, Batubulan is a popular centre for cultural tourism and attracts travellers looking for a unique souvenir to take home with them. Visitors to the village can even enjoy visiting the workshops and watching the artists at work. Batubulan actually means 'moonstone' and stone carving has been the main industry of the village for a long time. Everybody seems to be an expert in the art and children learn how to coax statues out of rock at a young age. The village does also showcase other crafts, like woodwork and textiles, and is known for its antiques but the stone work dominates. 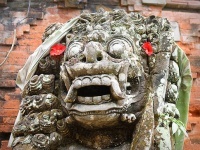 The temples in the area reflect the traditional talent of the local inhabitants and some remarkable stone carvings are on display at temples such as Pura Puseh. Another of the village's specialities is the performance of the blessing dance of Barong, which is performed on a daily basis at five different locations or stages: the Puseh Temple, Tegal Tamu, Denjalan, Sahadewa and Sila Budaya. As the village has become such an artistic hub, other villages nearby have perfected their own crafts, and the whole region is slowly transforming in to a vast open-air market.